Corus hotel Kuala Lumpur is just 5 minutes walk to the world famous TWIN TOWERS/ SURIA KLCC Shopping Mall and next door to Light Rail Transit (LRT) underground station for easy access to the city attractions. 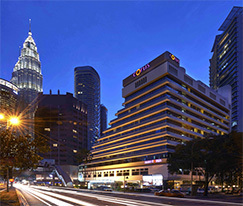 Corus Hotel Kuala Lumpur is situated in the prestigious downtown Kuala Lumpur City Centre (KLCC) vicinity within easy access to the commercial centres, embassies, entertainment and shopping outlets. Corus Hotel Kuala Lumpur welcomes you with a comfortable blend of warm Malaysian hospitality and contemporary style. As a hotel of international standard with an array of facilities, Corus Hotel Kuala Lumpur caters equally well to both corporate and leisure guests. We invite you to experience our passion for hospitality with helpful and friendly service in a relaxed environment. Guests can enjoy access to an outdoor swimming pool, sauna, and fitness equipment. 24-hour room service is available at the hotel’s main coffee shop and restaurant. Airport transportation is available for a fee and self parking is complimentary. Guest facilities include the gymnasium and out-door swimming pool . The Hotel also offers ample secured underground parking. This hotel has 356 guestrooms and 32 Suites, all of which include high- speed Internet Access and Wireless. Extra bed at RM104.40nett inclusive breakfast (Any additional charges are payable direct to the hotel). One(1) night stay for any late cancellation less than 72 hours upon arrival & NO SHOW status. a. Extra person charges may apply and vary depending hotel policy. c. Photo identification and credit card or cash deposit is required at check-in for incidental charges.